I’ve been thinking about this for a while but wasn’t entirely sure it was going to work. I considered swapping the cavolo nero for spinach and making a more traditional fiorentina pizza but was intrigued enough by the idea to continue and risk ruining our favourite Friday night dinner. We both love the rich, irony flavour of the cavolo nero but knew it would take some balancing to work as a pizza topping. Our usual tomato sauce is light and fresh but this time, we made a deeper, more heavily reduced sauce with plenty of garlic and oregano to stand up to the greens. Stephen cleverly suggested tossing the previously-steamed cavolo nero in some grated lemon zest to add an acidic note and, as well as the cooked mozarella and salami, we kept some aside and added it to the pizza when it came out of the oven. The fresh salami added some sweetness and the “raw” mozarella provided a lightness. We both said it was the best pizza we’ve ever had. The flavour combinations all worked together brilliantly and, without being too immodest, were as perfectly balanced as we could have hoped for. I’m looking forward to trying a similar combination next week with pasta but I might just cook this again. And again. 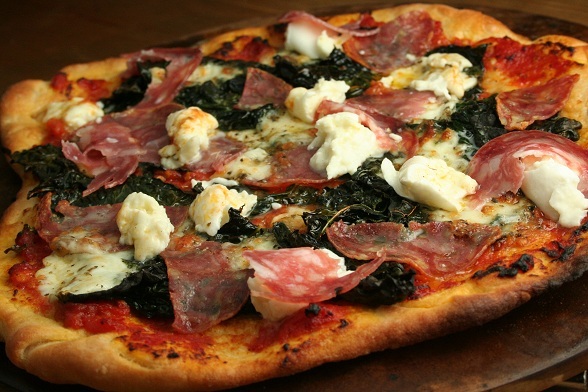 Subscribe to comments with RSS	or TrackBack to 'Cavolo Nero Pizza'.